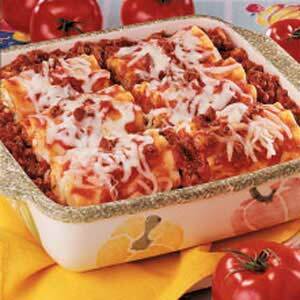 This lasagna roll ups recipe is very healthy and low in fat. Heat oven to 375. In a large pot, boil 4 quarts water over high heat, then add lasagna noodles, one at a time. Stir gently after adding last noodle, and boil 8-10 minutes. Noodles should be flexible but not overly soft. Drain noodles and immediately place on a baking sheet or cutting board in a single layer. In a large skillet over medium heat, cook ground turkey until cooked through, and break into crumbles, Add chopped onion and saute until onions soften slightly. Add crushed tomatoes, tomato sauce, basil, oregano, garlic, black pepper, and red pepper flakes if desired. Stir and lower heat to simmer for 1-2 minutes. Spray a small baking dish ( at least 9 inches square) with nonstick cooking spray. Handling each noodle separately, spoon about 1/4 cup of meat mixture along the length of the noodle, then roll up from one end. Place open-side down in the baking dish. Spoon remaining meat mixture evenly over the tops of the lasagna rolls. Sprinkle cheese evenly over the rolls and bake 25 minutes or until cheese is lightly browned. Garnish with chopped parsley before serving. My Greek Recipes - easy healthy recipes from the Greek kitchen. Greece have the lowest existence of diabetes in Europe. Learn how to adapt their diet to your life.